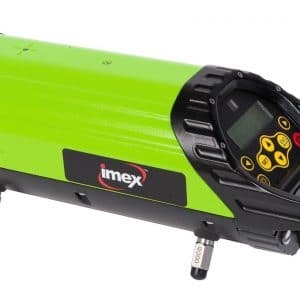 EasyMerchant has partnered with IMEX who is the pioneer in both linear levels and laser levels, providing the professional tradesman premium quality, advanced products and broadest range. The IMEX array of laser levels and electronic grade products has been given by our structure trained staff, designed and fabricated by laser levelling professionals. The most innovative laser levelling diode technologies is combined with strong housings and the renowned green laser colour. Laser Levels are designed to transport levels over a space, whether horizontal, vertical or even at an angle or slope or distance. Laser Levels are self-levelling projecting a spot, line, cross or a disk called laser plane or a laser chalk line. There are various types of Laser Level available for numerous building & construction and industrial applications. In construction, safety and surveying, the level is a management instrument consisting of a laser beam projector that may be affixed to a tripod. 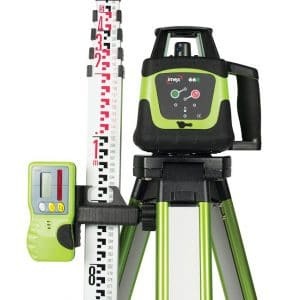 The vertical axis is levelled according to the accuracy of the device and projects a green or red beam for an easy view. Cross & Multi Line Lasers - for inside work, eg: dry walling, tiling, light, ducting and kitchen installation. With a Receiver these lasers may be employed for remote levelling up to a long range. Dot Lasers - A Dot laser is very like a line laser but instead of casting a line it generates a scatter. Usually these lasers will project a dot, or several, that will appear in view when the laser is flat. When showing numerous dots, they're seen at exactly the correct angle to one another. Rotary Lasers using a Receiver - utilised mainly on construction, building and civil engineering sites such as levelling over a place up to 600m radius. Rotary laser level degrees are utilised for building projects inside to shoot at a 360-degree horizontal or vertical beam around a room, or outside to be utilised with a laser sensor and grade rod for excavation for both grinding down or building up. You will find a variety of rotary laser levels to choose from. Pipe lasers are instruments for work in manholes, above ground or in the pipe itself. They are especially suited to sewer construction, gravity fed pipes and where a line grade and line is necessary. Built for the tough working environment, all the IMEX lasers here at EasyMerchant have exceptionally strong and durable cast aluminium housing. The pipe laser will fit within a 100mm/4" pipe and includes a very clear and easy to read screen allowing operators to view grade numbers, battery status, services, and the line and level indication. These levels utilise a laser, an amplified, focused beam of light emitted from a solid-state device known as a diode. They project a beam of light which can be utilised as a visual chalk line when a straight and level reference point is required. The dimensions of the beam of light is dependent upon the size of the diode. Tripods -- These are helpful tools to get in the laser degree globe. It can help provide a level flooring, making results more accurate. Remote Controls -- This product will enable you to adjust settings such as rotational speed, auto levelling, manual levelling etc. .
Laser Line Detector -- These instruments work alongside laser degrees and can provide acoustic or optical signals that make it easier to find laser lines. Batteries -- Strong rechargeable batteries are valuable, especially if laser amounts will be going on. Some batteries offer up to 2 days continuous operation. Leveling Staff -- Ranging from E-type, bar coded, regular invar & industrial invar, there are lots of levelling staffs to choose from to assist you with levelling. Our IMEX Fibreglass Levelling Staff is especially sturdy and durable and is ideal for levelling close to power lines and railways. How Do I Use a Laser Level? We offer many distinct options for all kinds of different building and home improvement projects. Working outside? Seeing a laser outside can be difficult, if not outright impossible just with the naked eye. Thankfully, most modern laser degrees out of EasyMerchant include green or red tinted glasses or goggles that make seeing a laser beam out simple. Rotary laser levels are the ideal choice for outdoor use. Working inside? You may need dot laser levels for drywall work, or cross line laser levels to show horizontal and vertical lines across every wall in an enclosed area. Thinking about how to tackle your job and use EasyMerchant's many different kinds of levels? Continue Reading below to get a handful of helpful guides. Put on the tinted glasses/goggles that came along with the kit. You will need these so as to see the laser beam in an outdoor setting. Put the level on a tripod and flip it on. Chose options on the digital screen. Aim the level in which you wish to have a reading. When you find it, lock the laser degree into place. Afford the laser receiver to where you want to have a reading. Either use the magnet which accompanies the laser recipient or place it on a level surface in the same elevation as the laser degree. A second tripod is a superb option here. Slowly move the laser recipient until it grabs the laser beam in the level. Utilise the level and receiver to discover the state or orientation of degree that you would like. Set up the level on a tripod on Secure Floor. Give it time to self-level. Identify a stage on the ground at your preferred height. Attach the laser sensor to a measuring rod and place the rod at this point. Fix the laser detector down and up. If you hear beeping, you've discovered level. Tighten the detector to the rod. The bottom of the pole is the preferred ground elevation. Locate another place on the floor and discover the height at which the sensor intercepts the laser. Mark the height by making a mark on a pole or building up a pile of dirt up to the desired elevation. Repeat this procedure till you have enough reference points to fill the area completely. Verify the tripod is stable. Turn on the laser level and give it a moment to self-level. Describe the initial elevation of your grade. The pitch of this grade slopes down from here. Place the bottom of the levelling rod in the desired height. Adjust the laser sensor up or down till you hear a beep. Let's assume a 10 inch fall for this particular example. Move the laser sensor up the rod 10 inches and then fasten it. Walk to where the bottom of the grade will be. Find par with the laser detector. You may either have to lift the pole (probably) or dig in to the ground based on the work space. The bottom of the levelling pole represents the bottom of the grade. Mark the spot by inserting a stick in the floor showing the desired height. Ascertain the desired height to the top of the picture frame. Make a mark anywhere at this height. Twist on the laser level and line up the laser with mark along the wall. Fix the amount so that the bubble sits between the black lines around the vial by pivoting around the point at which the mark and the laser match. When the laser is level and it runs throughout the mark, attach it to the wall . Measure the space between the top of the picture frame to its unique hanging mechanism(s). Measure this space on the walls, from the laser down to where the mechanism matches the wall. Punch a nail to the wall at the mark. Set the picture frame on the nail and line up the surface of the picture frame with the laser. 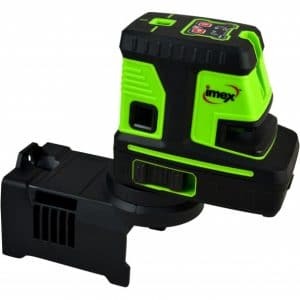 EasyMerchant has chosen IMEX as it's partner for the supply of high quality laser levels and power tools because IMEX is the pioneer in measuring and laser levels, offering the professional tradesman premium quality products and broadest range of laser levels including both red and green beam versions. Aside from having a more dedicated product range than the usual brands such as Stanley, Leica, DeWalt or Bosch, the IMEX array of multi line laser levels and electronic level products has been given by our structure trained team, designed and manufactured to perform in all conditions. The laser levelling diode technology is combined with housings and our green laser colour. If you want to achieve a direct line in the very precise and effective manner, this would be the tool you are able to rely on. Whether you're a weekend warrior hanging a shelf at home or a professional trades person laying laminate flooring on site, we're certain to have a the perfect level for you. We partner with IMEX laser levels who have a broad selection to match a range of applications. That includes cross line laser levels, self-levelling lasers and much more. We also provide free delivery on all orders over £120. When you order from EasyMerchant expect to be looked after. We will pick and pack your new order as soon as we get it. We keep the products in stock so that we can get them shipped to you as quickly as possible and at the best possible price. We understand that without the customer we do not exist so rest assured you're in good hands. Please feel free to create an account here at EasyMerchant when placing your order. This will give you access to view the latest offers, discounts and new products.